On Monday (2 days ago) it was the RSPCA cupcake day. It's a fun process and a lil bit stress while making it, cuz what if i screw it up? what if it taste like whole lump of sugar? but anyway, i have to finish it, and sell it! Judy is my 1st customer! She is very sweet, she bought 4 cupcakes from me~ 2.50 each. then brooke bought 1-$3, tony bought 1-$1.80, annette bought 3-$5, so i made about $19.80! Well, i feel good after i donate the money away hehe.. although its just $19.80!! 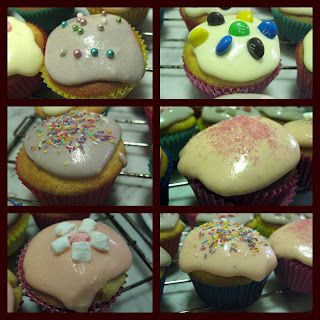 *my cupcake taste very good after chilling it heheheeheh very yummy!! !